The journalist Muntader al-Zaidi in an undated photograph released by his family. 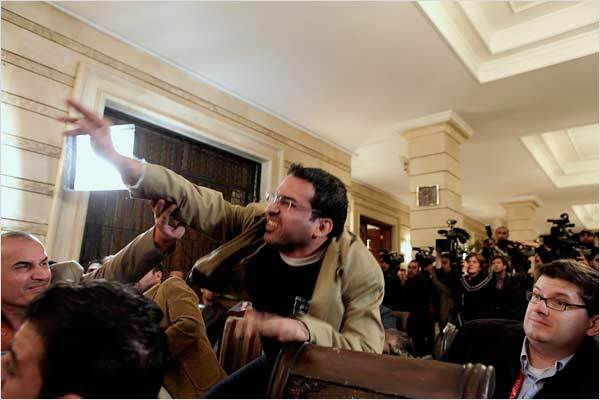 BAGHDAD — A session of the Iraqi Parliament erupted in uproar on Wednesday as lawmakers clashed over how to respond to the continuing detention of an Iraqi television reporter who threw his shoes at President Bush during a Baghdad news conference earlier thisweek, people attending the parliamentary meeting said. 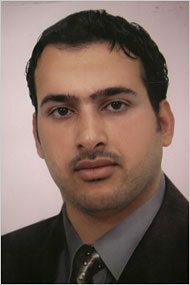 As Parliament began to discuss legislation on the withdrawal from Iraq of armed forces from nations other than the United States, a group of lawmakers demanded that the legislature instead take up the issue of the detained journalist, Muntader al-Zaidi, 29. After his shoes narrowly missed Mr. Bush’s head at the news conference on Sunday, Mr. Zaidi was subdued by a fellow journalist and then beaten by members of the prime minister’s security detail, who hauled him out of the room. Mr. Zaidi’s cries could be heard from a nearby room. The legislative session became so tumultuous that it prompted the speaker of Parliament, Mahmoud al-Mashhadani, to announce his resignation, according to The Associated Press. A spokesman for Mr. Mashhadani, Jabar al-Mashhadani, refused to confirm whether the speaker had tendered his resignation, although he would not deny it. Some in Parliament say the government should release Mr. Zaidi immediately, while others say the judiciary should decide his fate. How badly injured Mr. Zaidi was by members of Prime Minister Nuri Kamal al-Maliki’s security detail is not clear. He has not appeared in public since his arrest, and his family members and his legal representatives say they have not been permitted to visit him. On Wednesday, Mr. Zaidi had been scheduled to appear before a judge, but it was unclear whether that had happened. When his relatives and members of the media showed up at the court, they were told Mr. Zaidi was not there. Dhiya al-Saadi, one of Mr. Zaidi’s lawyers, said Wednesday that he was not sure whether Mr. Zaidi had appeared before a judge or not. As part of the Iraqi legal system, a judge typically serves in the role of investigator to determine whether bringing formal charges against a suspect is warranted, criminal lawyers in Iraq said. Mr. Zaidi faces up to seven years in prison if he is charged with, and convicted of, offending the head of a foreign state. The session of Parliament on Wednesday ended without a consensus on what action to take regarding the reporter, said Mr. Mashhadani, the speaker’s spokesman. Suadad al-Salhy, Abeer Mohammed and Riyadh Mohammed contributed reporting from Baghdad. send your shoes to bush. give the going away gift that keeps giving! I agree. We should all go down to our local second hand store, purchase an old pair of shoes, and send them to the White House. This man has not listened to anybody during the last eight years; perhaps he’ll respond to several thousand shoes in the rotunda. Older Article: OB Rag T-shirts have arrived ! Get ’em while they’re hot !